Along Route 191, north of Monticello, there are more county roads and I decided to check some of them out. My first venture was about three hours where I cruised up and down CR 120 (Gordon Reservoir), CR 333 (North Long Drive) and CR 332 (Hickman (s) Flat Road). On the map, CR 120 is highlighted in yellow, CR 333 and Hickman is in light blue. 1/10th of a mile from mile marker 75, due west, is CR 120; a graded dirt/gravel road for almost three miles; then more rocky and less maintained to the ATV trails. For the first 2.5 miles, both sides of the road are private property and farms; however, you get a great view of the Abajo Mountains. At 2.5 miles there is an ATV trail heading southward; there's no fencing or private property signs, or any signs at all, so it looks to have been made simply by local riders. 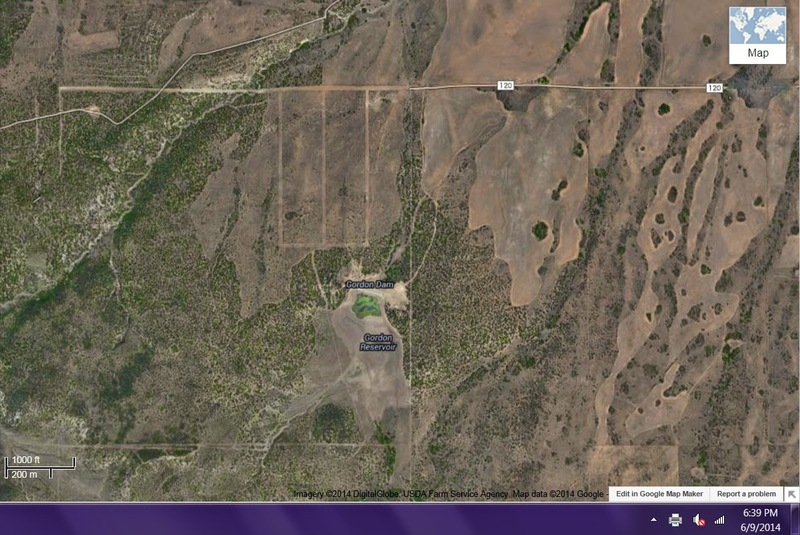 From the map, it looks like it might lead to Gordon Reservoir itself, but here's a topographic view anyway. There is also an abandoned home along the way; why anyone would simply abandon their home, especially with the view of the mountains behind, is beyond me. Seems to be the norm in this area to just pick up and leave. At 2.8 miles the graded road ends, there is a steep ascent to a rocky unmaintained road, but at the 3.4 mile mark are three ATV trails, one heading east, one going west, and the middle one going south. How far do they go and what is there to see? That's up to you to find out; I do know that there is a dried pond along the eastern one, but that's as far as I could travel in the SUV. To get back to Route 191, simply backtrack along the road just traveled. Directly across from CR 120 is CR 333; this entire road is private property and fenced off farmland. You can take the other roads that branch off of it, but they too are private and fenced off. However, if you want some great panorama views of the Abajo Mountains, with Monticello lying below them, this is the road for it. CR 333 goes for about 6.4 miles before it either continues north to Hickmans Flat Road, or east onto Farmers Road. Hickmans can take you either back to Route 191 or to the Colorado border. This photo appeared on the front page of the San Juan Record, June 4, 2014 edition; taken on Hickmans Flat Road. Now this story would not be complete without mentioning the wildflowers that can be found along the roads. So, to answer the question in the title of this post, sure there is! All you have to do is take off those blinders, open the eyes wide and LOOK!!! Keep remembering, life is adventure or nothing at all...do you want an adventure or nothing?